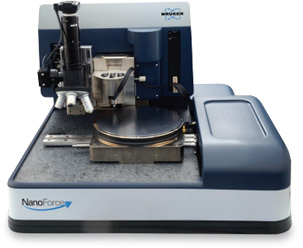 NanoForce features advanced quasistatic and dynamic indentation technology, plus additional functionality unique to AFM. This combination delivers unprecedented ability from a single instrument: nanoscale precision together with detailed nanoscale property characterisation, along with the flexibility, ruggedness and reliability required for mechanical testing. Blue Scientific is the exclusive distributor of the Bruker Nanoforce in the UK, Norway, Finland, Denmark and Sweden. 100 indents with Berkovich tip into steel; 1 μm grid spacing. Nanoindentation systems usually measure materials by applying a constant load and measuring displacement. 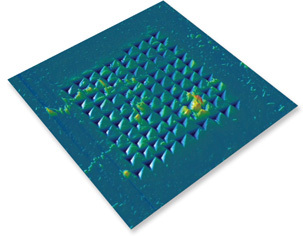 Dynamic nanoindentation involves a sinusoidal loading pattern, resulting in a wealth of useful material property data. Dynamic mode is included as a standard and is a key benefit the NanoForce. analysis of the phase shift. Above is the phase shift at a constant load over 10 seconds for elastic (Test 1) and viscoelastic (Test 2) materials.